The Falcon G300 series with Trace Validation™ provides complete protocol debug and analysis of UFS and UniPro devices. The G300 is a protocol analyzer that supports MIPI M-PHY v3.1 HS-G3, UniPro v1.61, and UFS2.0/2.1, and is HS-G4 ready. The G350 is an exerciser/analyzer that also supports execution of the UniPro CTS v1.1 and JEDEC JESD224A CTS. The G350 is HS-G4 ready. 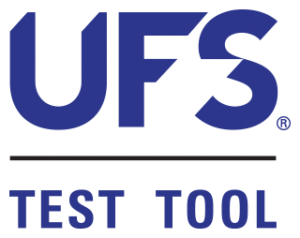 The Falcon G300 series is UFSA-certified to verify compliance of UFS devices with the UFSA UFS Compliance Test Matrix v1.3. Trace Validation: an expert system analysis tool that uses complex state-machine logic to analyze protocol sequences and packet characteristics in captured traces. It analyzes the bi-directional UniPro and UFS traffic, performing protocol sequence and timing analysis and packet header and payload inspection. Events views: display UniPro or UFS events on the bus in a unique time-aligned display. UniPro Events view displays fillers, Prepare, SYNC, Hibern8, sleep, stall and other M-PHY level packets. Events view presents a complete picture of all events and allows drill-down to the lowest level bytes. Compliance/Conformance Verification: execute a range of CTS test cases, analyzing results using the Trace Validation engine and generating pass/fail summary reports. Stimulus with full UniPro stack in HW: allows creation of specific traffic on the link and offers extensive error injection. Test executive stress testing: controls the DUT and executes hundreds of thousands of tests automatically. Stop after any number of loops or No Result Test Cases, then analyze the results with Trace Validation. Custom test case Builders: to create tests to introduce errors for corner case, margin, or stress testing.